Welcome to another Good e-Reader Comparison Video! Today we look at both of Kobo’s latest generation seven inch tablets that are available right now. 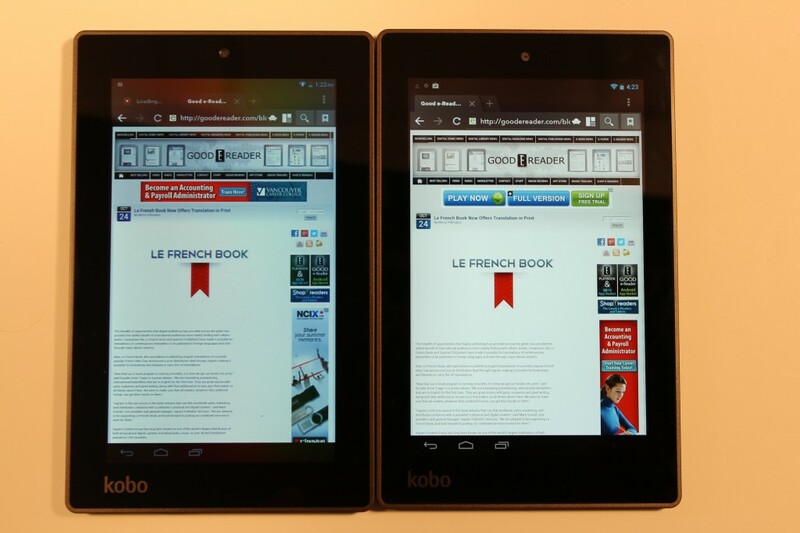 I am of course talking about the Kobo Arc 7 and Kobo Arc 7 HD. We put these two devices head to head reading eBooks, watching videos and a whole lot more! You can think of these two new gadgets as looking aesthetically the same but having very different internals and overall resolution. You can put both of these in front of your average customer and they would be hard pressed to tell you the differences, other than the price. The Kobo Arc HD features a seven inch capacitive touchscreen display with a resolution of 1920×1200 pixels. It currently has over 323 PPI and will play back videos in pure 1080p. This is quite an upgrade in screen technology over the original Arc, which only had 1280 x 800 HD resolution and 215 PPI. Underneath the hood is an Nvidia Tegra 3 quad-core processor that is running a very solid 1.7 GHZ. There is also 1 GB of RAM and 16/32 GB variants for storage space. There is no expandable storage with this model, so make sure you buy the one that suits your needs. Yeah, I think I’ll stick with my current Arc. No reason at all to downgrade to an Arc 7 and the HD 7’s too pricy just to get a better screen. Is there any comparison with the Kobo arc vs arc 7? I am looking to upgrade my Kobo WiFi (second model they came out with!) and I would like to know if there is a big performance jump between the arc and the arc 7. I like the arc’s speaker placement, and both have the SD slot, which I really like. But, will the extra $10 and having the speakers in the back make me wish I’d gotten the arc? Love the arc 7 hd but it has proven to be physically fragile – a much cracked screen has rendered it useless. Getting replacement for 7 hd seems impossible but I have seen replacement screen digitizer glass for arc 7 Black – would this work??? ?